In part III of ToM’s coverage of the 2012 Policy History Conference traverses the whole of post WWII 20th century history. From the efforts of municipal leaders to construct expressways boosting downtown development in the 1940s to the role of 1970s sexual debates and the onslaught of AIDS in reforming health policies to 1990s military activism that pushed back against the Army’s long history of discrimination against homosexuals, PHC participants engaged a range of topics and periods. Here they are. Author of From Front Porch to Back Seat, First Strange Place, and America’s Army, Beth Bailey has long addressed issues regarding gender, sexuality and military service. Here Bailey provides an abridged version of her upcoming Policy History Journal article on the debate over homosexuality in military. Along with Catherine Lutz, Carol Lynn McKibben, and Andrew Myers, Bailey has helped to map considerable territory regarding the place of the military in 20th century American life. In “Military Exceptionalism”, the Temple professor builds on her impressive historiography tracing the arguments behind opposition to gays in the military and the ways in which the language of morality faded in favor of new arguments emphasizing efficiency and security. The latter marshaled in an attempt to build a broader coalition of groups opposition to gays in the military. As Bailey notes this argument collapsed under the weight of changing public opinion. Ultimately, opponents of gays in the armed services who employed the new language of exclusion did so to maintain the status quo, unwittingly laying the groundwork for the more inclusionary policies they feared. 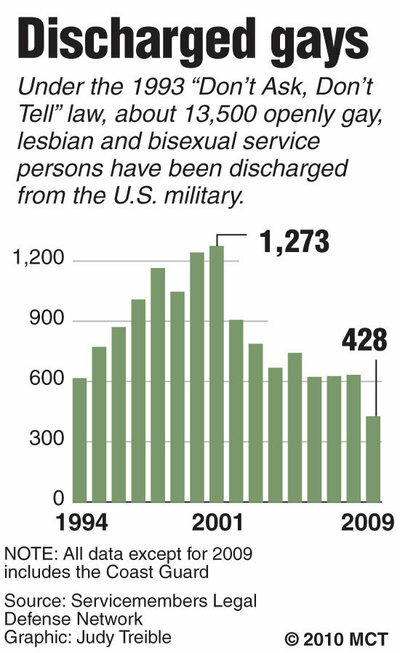 Though in 1949 the Department of Defense issued a uniform service ban on homosexuality, by the 1970s attitudes had begun to shift. The Carter administration continued the military’s ban on homosexuality, however, due to numerous right-based lawsuits brought by the ACLU and discharged gay and lesbian personnel, the logic supporting the exclusionary policy changed. If homosexuality had previously been unsuitable for service, it had now become incompatible — a distinct and serious change that reframed debates. By the 1990s, media attention highlighting the difficulties of being gay in the military, the efforts of groups like the Gay and Lesbian Freedom Project, and Bill Clinton’s 1992 campaign began to chip away at arguments opposing gay service personnel. Unfortunately, the very prominence of the issue sparked a conservative backlash enabling Congressional Republicans to use the issue to rally their base and place Clinton in conflict with his Joint Chiefs of Staff. Due to the above political difficulties and the structure of the AVF itself, Clinton retreated from campaign claims to eliminate the ban on gay service personnel. The President equivocated leaving America with the problematic DADT policy. In regard to the AVF’s structure, though the military’s racial and ethnic diversity had expanded significantly, the AVF still depended in part on the enlistment of young people from smaller more conservative towns. Self -identified conservatives jumped from 4 to 1 to 30 to1. Military officials hoped to avoid conflict with such recruits, so they tread lightly. 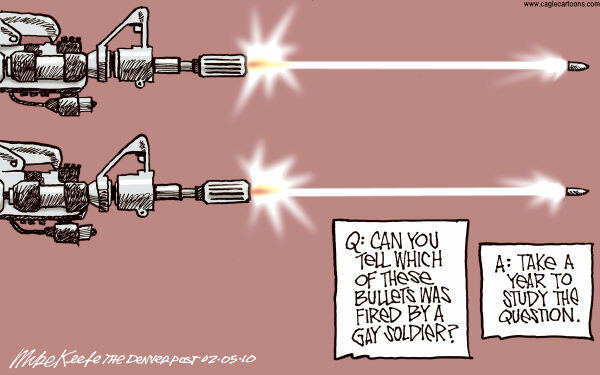 Still, even with this concern, the logic behind the ban on gays in the military shifted once again. Morality and faith-based opposition were replaced with arguments about how the military operated differently from civil society. Gay soldiers threatened to disrupt unit cohesion as some enlisted personnel would never accept homosexual peers. In a speech to Navy Midshipmen, Colin Powell eschewed moral claims but did instruct enlisted personnel to resign should they believe homosexuality truly compromised their morals. Even as all of the services had established working groups to discover measures to end the ban with minimal disruption, officials subordinated policies to their juniors. Of course, the possibility exists that military leadership used the perceived prejudices of their enlisted personnel to hide their own biases. Whatever the motivation, DADT remained official policy. Regardless, the military’s new logic proved difficult to maintain. Changing public attitudes toward homosexuality made the military’s DADT temporarily acceptable, but 9/11 reoriented priorities. When more than 300 language experts were fired under the provisions of DADT even former Republican Senator and DADT supporter, Alan Simpson openly questioned the policy: “Is there a “straight” way to translate Arabic? Is there a “gay” Farsi? My God, we’d better start talking sense before it is too late.” Reservations about sexuality faded away in the face of terrorist threat. A great deal of activism also mattered. In its final years, activists produced studies debunking efficiency and security arguments. Testimony by Iraq veterans challenged fears about cohesion and even religious leaders avoided deploying morality in their continued opposition. When moral arguments did emerge, they focused on military codes and traditions. DADT placed gay soldiers in a moral quandary as the policy forced them to compromise their own integrity, a central value of military service. Much remains to be done regarding the recent elimination of DADT, but Bailey’s conclusions demonstrate how the intersection of discourse, activism, and changing demographics can alter the most august of institutions for the better. As has been documented by the aforementioned Bailey and others, the shift to the all-volunteer force (AVF) put into motion numerous demographic changes including increased minority enlistment, greater numbers of women, and a sharp rise in the number of families attached to service personnel. Though families had always existed within the military, the AVF resulted in unprecedented numbers. Just prior to the Vietnam War, 40% of Army personnel were married. By 1985 58% of enlisted personnel and over 70% of officers could say the same. 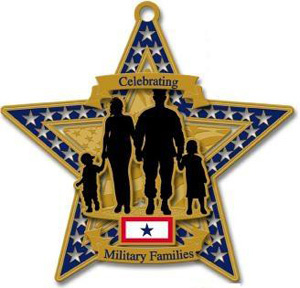 The number of dual Army families also rose. Unfortunately, the Army lacked any real strategy or quick response to these changes, forcing military households to defend their own interests.. John Worsencroft explores the role that Army wives played in influencing policies aimed at improving the lives of military families. Though families rapidly proliferated, the Army, lacking any coherent strategy, responded slowly. The economic problems of the 1970s hit military households particularly hard. As the decade ended, service members’ real income dropped 18%. Many families relied on secondary employment or filed for food stamps. It fell upon the wives of soldiers to affect change. In 1980, a collection of army wives organized a symposium on the Army family. Participants put forth 13 areas in need of improvement, chiefly among them lines of communication between families and the Army. Symposium participants pointed out several other problematic issues. Frequent relocations, impacted careers. For wives, transience prevented steady employment, which further undermined future job searches. They demanded solutions. Army wives requested the establishment of job opportunity centers to help with employment. They argued for an end to the term dependents when referencing spouses and wanted more influence in deciding where they lived and under what conditions. In its second year, the symposium promoted agency by wives. Though the Army responded slowly, the appointment of General John Adams Wickham proved a game changer. Though a conservative religious man, Wickham avoided religious imagery often speaking at length on the women’s movement and civil rights. The defense of the family attracted conservatives and while James Dobson and Wickham spoke at length, the general demurred when Dobson’s suggested sectarian solutions. The general’s own experience – his father’s WWII service caused the dissolution of his family – proved influential. Wickham approved of the women’s activism crediting them for drawing the Army’s attention to serious problems within its ranks. When a 1983 white paper report on the Army family confirmed the assertion of the Army wives symposiums, Wickham engaged in reform. Unveiling the Army Family Action Plan in 1983, the new program aimed to address soldier and family issues impacting readiness and included provisions that among other things increased family members’ access to educational resources. When General Wickham declared 1984 the year of the family, the distance from the 1980 Army’s stance on military seemed vast. Still, even today military families struggle to find quality housing and remain vulnerable to economic downturns. When in June 2010, Newsweek’s Kristin Lombardi bright reported on the all too common dilapidated schools that serve on-base dependents, questions about the nation’s commitment to military families need to be addressed. Reforms like AFAP have only solved so much. Worsencroft provides an early history of these developments and the women who made them a reality. Understanding both makes achieving better lives for military families that much more possible. Depending on the company one keeps, the name of Ralph Nader elicits guffaws, anger, and sometimes deep abiding respect. Nader’s legacy dates back to the 1960s, yet, the infamous Gore-Bush election recast Nader as a sort of spoiler whose opposition to the vice president sealed Bush’s narrow victory ushering in a president that many felt was unprepared for the task. However, as English scholar Daniel Scroop argues, this view misses the mark. More than any other activist-writer Nader has persisted for several decades. While Rachel Carson’s Silent Spring remains an influential text, Carson as a figure lacks Nader’s public visibility. The same can be said of other writers of the period like the late Michael Harrington. 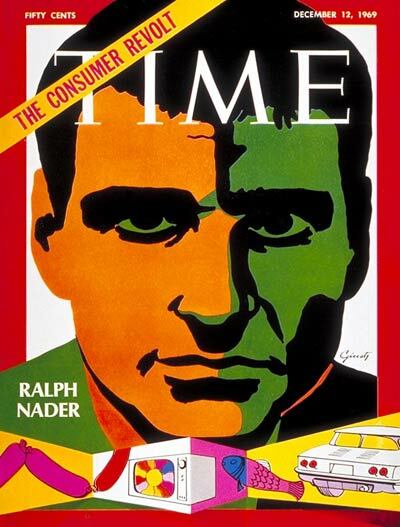 Despite his unyielding consumer advocacy, historians of the 1960s largely ignore Nader’s presence. Scroop hopes to remedy this omission. Scroop cautions that Nader’s philosophy cannot be shoved into a thirty second sound bit and his career and philosophy fail to align with typical rise and fall narratives regarding liberalism and conservatism. From the outset, Nader cared less about political parties or ideology than he did three core issues: corporatization, the politics of regulation, and the reach of the state. His distress over the accumulation of power by public and private entities balanced out any hard ideology one might associate exclusively with the Left or Right. Scroop encapsulates the animating principle of Nader’s political life: the politics of scale. In some ways, this concern for scale or “bigness” harkens back to earlier eras. 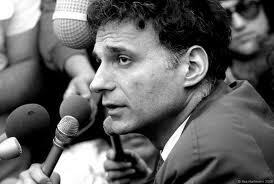 Fashioning himself as the classic “outsider,” Nader often echoed earlier anti-monopoly crusades. Massive institutions hurt everyone; large corporations differed in degree and kind from smaller ones. Like a latter day Brandeis, Nader worries that bigness threatens democracy. As Scroop points out, Nader even extols the virtues associated with nineteenth century life – thrift, frugality, life’s simple enjoyments – while expressing a very similar lament to that of his predecessors. After all, few issues bedeviled nineteenth citizenry like industrialization and monopolies. Nader’s political solution: an active citizenry that attends small scale town meetings and physically interacts. As noted, Nader fears most the stockpiling of power by various forces whether they be large corporate conglomerates or the federal government. In this way, Nader provides a window into the ways Americans navigated the changing tides of economic liberalism in the 1960s, 1970s, and 1980s. Though Nader critiqued large scale business corporatization in the 1970s, National Chamber of Commerce chairman Edward B. Rusk acknowledged that the consumer advocate promoted the virtues of the market place so often lauded by the business sector. Nor did Nader shy away from criticizing government regulations and interventions that he argued distorted markets and sometimes colluded with big business. At times, Nader sounds like a classical economist. As result, conservatives have employed Nader’s critiques as means to promote deregulation policies. How did Nader differentiate himself from the others? From the 1960s onward, Nader combined research and political mobilization through a semi-institutionalized form. The Center for the Study of Responsive Law and Public interest Research Groups (Nader inspired by not run) stand as two examples of this fusion. He also demonstrated adeptness with media in spreading the cause. Using classic juxtapositions, like the little man versus big corporations, and unafraid to use severe imagery, Nader skillfully came to embody the broader hopes of a citizenry who saw an America veering in a dangerous direction. Neither liberal nor conservative, Nader’s positions on issues remained constant, but the resonance of the institutional environment did not. Antipathy to bigness threads throughout his political life, but in various moments this “politics of scale” found itself threatened by different actors. When the 1970s economy faltered, he attacked regulatory agencies while simultaneously proposing regulatory solutions. Over the past forty years, American political life, or at least how we conceive it has narrowed. Understanding a major political figure without assigning that person a party affiliation or subscribing to well embedded tropes about liberals and conservatives seems to have become increasingly difficult. Scoops suggests Nader might be one way to do this, while also gathering a better understanding of how Americans viewed their nation during the crisis of the 1970s. Instead of enlisting the help of the federal government we organized a disco fundraiser. We thought small. We thought ghetto. We didn’t understand that we were watching the beginnings of an epidemic that would soon enough infect forty million people worldwide. To be fair, no one had that sort of apocalyptic prescience any more than we did. Nor was Ronald Reagan even willing to mention the disease by name until years later. — Edmund White, City Boy: My Life in New York During the 1960s and 70s, 287. Edmund White’s memoir about his life in New York during the tumultuous 1960s and 1970s, comes to somber conclusion as the story enters the 1980s and the AIDS crisis begins. The tragedy of AIDS plays out on Citys Boy’s final pages, but Johnathan Bell suggests that the acknowledged darkness or the epidemic also helped advance medical care and operated as a tool for reforming the nation’s larger health system. As Bell notes, the crisis of AIDS placed great strain on the public health system but also encouraged new initiatives and the formation of public private partnerships. In the wake of the sexual revolution, rights movements, and the Great Society, liberal politics engaged at length with the question of health. 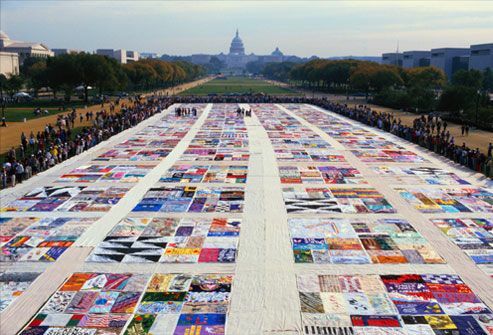 In the 1980s, the system struggled to incorporate individuals with AIDS. Medicaid and Medicare may have expanded state medical care but new questions regarding what qualified as minimal standard of public health and who was included within these boundaries. On the cultural front, the gay liberation struggles of the late 1960s and 1970s helped to create a growing acceptance of sexual difference. The individual moved to the center of the rights bearing policies. Sexual politics played no small part in these developments. The 1972 National Commission on Sexual Diseases demonstrated a growing public concern regarding venereal disease. Medical societies, citizen’s groups, churches, and others convened to discuss the problem and in the process established public private partnerships aimed at developing metropolitan solutions to the spread of STDs. When Jimmy Carter expressed an increased concern over sexual health later in the decade, his administration wanted to improve these public private sector connections. Of course, while some acknowledged sexual difference, others formed a conservative backlash. Opponents blamed the overextension of government as part of the reason for the upheaval of the 1960s. However, in regard to Medicaid the backlash advocated increased state control over funding. In the 1970s, great differences existed between state health care systems. Robust systems were rare, but states like California used state control to expand its health care infrastructure. By 1976, the Department of Health commissioned a study on the health services in Berkeley, CA. A sexual health infrastructure slowly took shape well before AIDS, but the epidemic would accelerate debates health care systems in general. The language of universal health maintenance emerged despite the fact no universal single payer option existed. Most historians focus on Reagan or the protests of the gay community, but Bell draws attention to elected officials who did address the problem. In this regard,, California stood at the forefront. The sate took a number of actions like AIDS drug assistance and laid bare the shortcomings of the health system. Still, even in its successes, California struggled. San Francisco’s system of integrated community care encountered more problems and proved difficult to translate elsewhere. Some observers saw in AIDS a vehicle to fix the larger problems of American health care. In places like New York and California, the state and health providers acknowledged “compassionate deliver[y] of services” embracing a human rights logic with an acknowledgement of sexual difference. Public health funds went to HIV sufferers. As the Obama care debates demonstrate, the nation has yet to settle on a plan to go forward. Bell points to a new means of perspective on these issues and the ways in which American ideas of what constitutes adequate health care have changed. Edmund White rightly despaired in the early 1980s, but perhaps AIDS might also help us better understand what our health care standards should be and how to administer them. The varying impacts of the 1956 Interstate Highway Act have long been documented. Though the system of interstates radically improved transportation infrastructure connecting cities to each other and to their outlying suburbs, it also shifted the balance of power between suburbanization and urbanization to the former. Yet as Roger Biles argues well before the 1956 legislation, pro-growth mayors and the business elites that often backed them, lobbied for and built expressways establishing precedents for later interstate construction. Federal aid in this period helped as did the expertise of federal engineers who assisted local highway departments in drafting plans for new routes. The Bureau of Public Roads (BPR) funded surveys in 60 cities and 120 metropolitan areas to sketch plans and determine feasibility. With that said, it was the efforts of local policy makers and elected officials pushing forward in the 1940s and early 1950s making construction a reality. 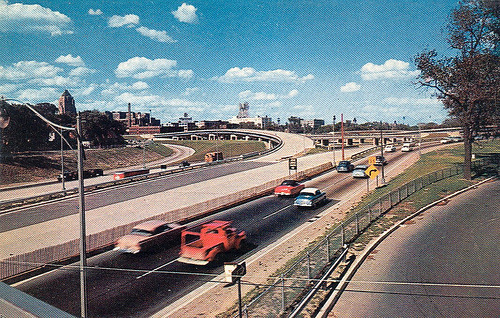 By 1956, New York, Chicago, and Detroit had all completed expressway construction. In 1945, mayors of traditional industrial cities feared the effects of demobilization and the trend of businesses and manufacturing interests to relocate to what would become known as the American sunbelt. Though not specifically about expressway construction, the “urban renewal” statutes of the Housing Acts of 1949 and 1954 enabled municipalities to direct some federal monies for road building. In Detroit, city officials and elites combined state, federal and county funds to build two new expressways connecting the city center to outlying Oakland and Wayne county suburbs. Unsurprisingly, Detroit’s role as a key defense industry manufacturer in WWII spurred the movement for expressway construction in 1942. Defense workers and others needed more direct passage to their employment. The drive to build may have begun in 1942, but actual construction took time. Lobbying for federal aid in this early period proved a mixed bag. Collecting money through the taxation of licenses and gas, the city, state, and county came up with a loose funding mechanism. Slapping together a “triparty fund”, Detroit officials secured 1.5 million from the county, 1.5 million from the city, and 3 million from the state, which along with 4 million from the federal government freed up 10 million per year. Not bad until one considers each mile of expressway cost 7 million dollars. Albert Cobo’s 1949 election to the Detroit’s Mayor’s office helped to remedy funding issues. Often referred to as “Little Al the Big Builder,” Cobo campaigned on a platform that promoted expressway construction as a means to reduce snarling rush hour traffic and reinvigorate downtown development. Cobo proposed the state and county issue 30 year bonds to be paid for by user fees and gas taxes, this he argued would enable construction to be completed in four years. It never happened but provisions of the Federal Highway Act of 1950 allowed state and local governments to pay off bonds for new road construction. Thus, even though the outbreak of the Korean War sharply curtailed federal highway spending, these aforementioned provisions accelerated building efforts. Perhaps it goes without saying that land acquisition and condemnation drew controversy. Official rhetoric claimed that neighborhood disruptions would be kept to a minimum and only buildings on the verge of collapse could be demolished in favor of construction. Additionally, expressway routes were meant to traverse industrial areas, providing a buffer between communities and industry. Such efforts, officials argued, both improved quality of life and boosted business. Predictably, it played out differently. Middle class white enclaves curried favor as officials protected such neighborhoods while minority communities failed to receive the same consideration. One densely populated downtown African American community lost 2200 buildings, creating what one local Black entrepreneur labeled “a no man’s land.” Elected largely without the aid of African American voters, Mayor Cobo willingly sacrificed these communities in the name of expressway construction. Small businessmen too objected, claiming that compensation for their shops and businesses fell significantly below market levels or failed to make up for the costs of relocation. Clearly, for all involved, expediency trumped fairness. Cobo summed up the disproportionate sacrifices of these constituents as “the price of progress.” By the 1960s, the Edsel Ford and John C. Lodge Expressways begun in the 1940s were joined by their Chrysler and Hastings counterparts. In the end, the federal government played no small part in the nation’s highways, but local officials intervened well before the landmark legislation of 1956. While many blame urban renewal on misguided federal policies, Roger Biles pushes the discussion back, demonstrating that numerous post war municipalities set the tone and direction of federal efforts well before the mid-1950s. When Richard Florida released the popular but somewhat controversial Rise of the Creative Class in 2002, Florida argued that in many ways the kinds of things that “creative types” liked made cities more livable. Creative industries and professions beget individuals who reshaped cities with bike lanes, cultural festivals, coffee shops and other amenities sometimes derisively associated with twee white middle class professionals and hipsters. However, as Michael R. Fein demonstrates, livability policies impacted more than cities but also the transportation arteries that supplement or drain, depending one’s view, the nation’s metropolitan areas. In some ways, the drive toward livability has simply resulted in an effort to map comparative advantages in some pseudo-quantifiable way. Livability may be about park space, but what does it mean in practice when planners and officials implement the term in highway construction? Livability federal policies stretch back to Carter’s 1978 Livable Cities – discontinued by Ronald Reagan – and Clinton Gore’s Building Livable Cities programs both of which set the stage for Obama’s 2008 Livability Initiative and the Interagency Partnership for Sustainable Communities. The term livability came to dominate the visions of policymakers, but what exactly was livability? As Fein correctly asks what does the term mean? For Carter and Clinton, this meant less an overhaul of transportation policy than conservation. Yet, Carter’s policy offered little real support for cultural protection let alone the rights of minority communities. When Ray LaHood assumed the position of Secretary of Transportation under President Obama, his definition of livability appeared to be organized around anti-automobility. Fein demonstrates that whatever LaHood’s rhetoric, the results hardly dented the centrality of cars in American life. Using the example of Guilderland, New York, Fein explores the policy implications of mall, throughway, and interchange construction on the local community. In this context, Fein argues that capital trumped livability as private capital dictated where and how growth unfolded. Located southwest of Albany, Guilerland proved the perfect site for a new mall in the 1980s. The state capital lacked adequate shopping centers leading Pyramid Management Group (PMG) to propose the construction of a new mall in Guilderland. 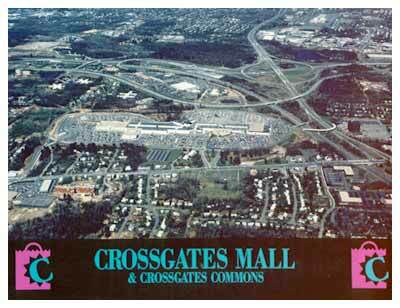 Over the objections of residents who feared the loss of both the area’s historic Black community and old growth forest, Pyramid completed Crossgates Mall in March 1984. 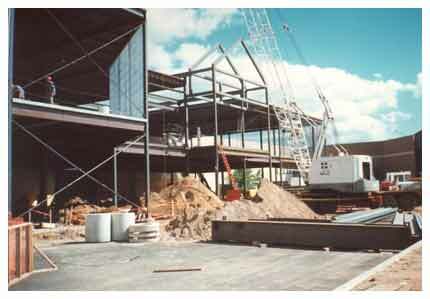 In 1994, under the aforementioned Building Livable Cities initiative, Pyramid expanded the shopping center. Critically, Fein notes that despite LaHood’s apparent critique of automobility, an October 2010 corridor study proposed that hazardous walking conditions forced mall employees to cross the highway by foot; an interstate highway exchange would alleviate this problem. PMG had long wanted to expand and an interstate highway exchange promised to deliver a greater volume of consumers. Though a highway exchange violated principles of livability – the absence of safe walkways, disruption of local communities — – local officials too saw economic viability residing within its proximity. Several notable studies disputed the opinions of local officials. A1976 survey suggested that exchanges ultimately proved problematic contributing to “garish commercial development” and sprawl; a 2000 report piled on noting that they complicated distressed areas, shifting economics rather than creating new opportunities. Neither prevented construction. Crossgates Mall’s dedicated service ramps represent only one example of a proliferating national example. Outside Milwaukee off I-94, construction continues on a large exchange that largely benefits retail destinations. Characterized by fake architecture and “Edge City” flyover ramps that feed into shopping centers, this kind of highway construction undermines the multi-transportational vision exhorted by Obama officials. If policymakers really hope to improve livability they need confront the long history of automobility and come to an understanding on what the term really means.